This is part 1 of a guest blog written by Lisa Eliason of Athens, Ohio. My personal journey with A-Fib began on March 21, 2012 when I awakened from an aborted sinus procedure to find nurses and doctors rushing around me to make way for the cardiologist. My husband stood at the side of the bed looking ashen. He quickly explained that as soon as I was given the anesthetic my heart went out of rhythm and began to beat quickly and erratically. I was distraught over not having the surgery, but not surprised by the arrhythmia. For the last year I had been telling my family doctor that I had irregular heartbeats off and on, mostly at night, and never during exercise. My doctor wanted to prescribe medication for my stressful job. He never took the irregular heart beat seriously. After this incident, I saw a local doctor who prescribed medication that caused my heart rate to slow, at times, to thirty-five beats a minute. Family members talked me into going to Ross Heart Hospital to see Dr. John Hummel. I describe Dr. Hummel to my friends as the rock star of electrophysiologists. Dr. Hummel gave me all my options from medication to ablation surgery. Ablation surgery sounded so serious so I tried the medication option first. I was also required to wear the Holter monitor and found out the hard way that I was allergic to latex. I suffered with “bulls-eye” welts for several days after. Dr. Hummel suggested the loop* recorder to keep track of my irregular heart rhythm. I can remember asking him if he had heart arrhythmia, would he have the loop inserted. His answer was an unequivocal “yes”. *The implantable loop recorder (ILR) is a single-lead electrocardiographic (ECG) monitoring device used for diagnosis with recurrent unexplained episodes of palpitations or irregular heart rhythms known as atrial fib. Read more from guest blogger Lisa Eliason and her experiences in Part 2 of Atrial Fib & the Loop in next week’s blog on this website: rosalieungar.com. 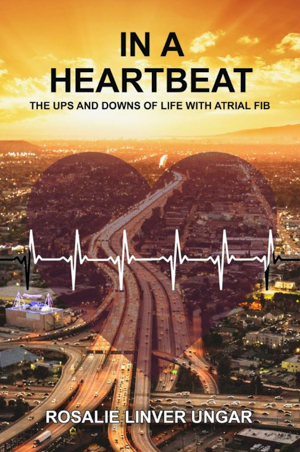 Click on IN A HEARTBEAT: The Ups & Downs of Life with Atrial Fib. This entry was posted in Blog on September 10, 2017 by Mark Layman.